Two molecularly imprinted polymers (MIP) have been prepared using the acidic drug salicylic acid, which can form intramolecular hydrogen bond, as the template and acrylamide or 4-vinylpyridine as the functional monomer. 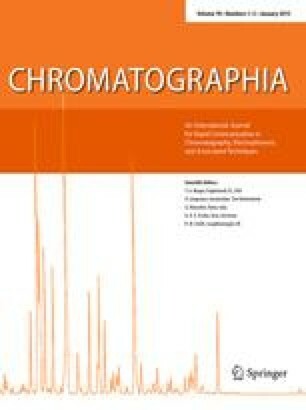 HPLC was used to evaluate the binding performance of the MIP for the template and for several analogues. The results showed that the MIP (P2) prepared using acrylamide as the functional monomer had no molecular imprinting effect whereas that (P1) prepared using 4-vinylpyridine as the functional monomer had a significant molecular imprinting effect. The reason the molecular imprinting effect was different for the two MIP was elucidated and the molecular recognition properties of P1 were studied in detail. It was confirmed that electrostatic interaction played an important role in the molecular recognition of P1. Scatchard analysis showed that two types of binding site with distinctly different affinity were formed in P1. Their dissociation constants were estimated to be 7.6×10−5 mol L−1 and 3.2×10−3 mol L−1, respectively. Because P1 has high affinity and selectivity for salicylic acid not only in organic systems but also in water-containing systems, it gives P1 the potential for use in the enrichment, separation, and detection of salicylic acid in biological fluids.